Sanders Valley Cherelle Speen (21) has been the starting quarterback since last season and during the offseason she worked hard on improving her throw. With Speen behind center the Pirates enters Friday’s game with a 3-2 record. Football is not only for male student-athletes. Just ask Sanders Valley’s sophomore starting quarterback Cherelle Speen. "I love the game of football, that is the main reason I play the game," Speen said. "I played flag football and was the team's quarterback in elementary. I continued playing football in the middle school, playing quarterback. “As a freshman last year I went out for the high school football team and made it as a quarterback,” she said. “This year I am playing my second year on the varsity football team as a quarterback." Speen said she had the opportunity to play volleyball but opted to play football. "I wasn't interested in playing volleyball," she said. "I've played with many of my football teammates since elementary. I wanted to continue as teammates, playing football with them. I've known them so long. My teammates respect me and I respect them." 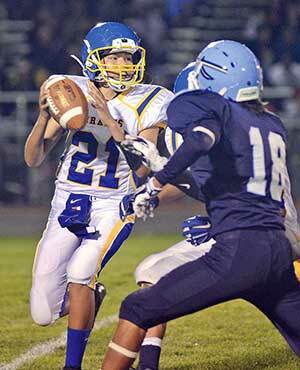 Speen started seven games as the quarterback for Valley last year and is continuing the trend this year. She has been the starting quarterback in all five of Valley's games this year, leading the Pirates to a 3-2 record. "Cherelle is a player I want as the starting quarterback," said Valley head football coach Joshua Catron, who played collegiately at Stanford University. "She is smart, disciplined, a hard worker, with a great attitude and a player you want to coach. She listens and is willing to learn more about the game of football." During her two years as the Pirates' starting quarterback, Speen has played against bigger and stronger defensive opponents. She said she does not fear getting hit and tackled. "I've been hit hard and tackled," she said. "The offensive linemen do an outstanding job of blocking for me. The offensive linemen protect me. The opponents do not know I am a female starting quarterback until the game begins."